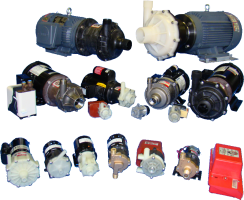 March Manufacturing, founded in 1954 and situated outside of Chicago, has been and remains one of the leaders in the production of magnetic drive pumps. March started manufacturing magnetic drive pumps in 1963. Magnetic drive pumps are seal-less pumps, meaning they are emission free. For this reason, they are great for liquids which can be highly corrosive and dangerous to handle or liquids which are too expensive to have any leakage occur. Currently, March has over 20 completely different series of pumps with over 200 variations available, all under 210 gallons per minute with a maximum head of 160 feet. We are an authorized stocking distributor for Arizona.